Benito Santiago has no memory of his father or the events surrounding a critical time when he was an infant. It is a story of perhaps destiny, yet also of the choice of a woman who could have walked away from a situation for which she had no responsibility. The tale of how Benito came to have two families was portioned into pieces, small bits explained over time as he grew older and could grasp the answers. “I was born in Ponce, Puerto Rico, on March 9, 1965. We were rather poor. My father, Jose Manuel Santiago, drove one of the trucks carrying cargo from San Juan to Ponce. They called him ‘El Capitan’because he always had a shipping captain’s cap on. He was very handsome in his photographs. During his work, he would deliver loads of concrete to Modesto Gonzalez in Santa Isabel where he was building a house for his family. My father and Modesto became friends. “The road between Ponce and San Juan was rather dangerous in those days. It was not like the wider roads now, and there were steep inclines with not much room for big vehicles. I was only three months old when the truck began to slide off the road and my father fell from the truck to free himself from the crash. He was injured, but like a lot of village people, he wouldn’t go to the hospital. They preferred home remedies. When he finally went to the hospital, it was all bad news. He was quite ill and without much hope given to him from the doctors. It seems as if he knew he was not going to live for long. While he was there, Nelida Gonzalez, Modesto’s wife, was in the hospital because one of their girls had broken her arm. She saw ‘El Capitan’ and in talking with him, he asked them to come to pick me up from where I was at my sister’s and take me to their house to raise me. He told her I was very young and very weak and my mom already had five more children. I don’t know why he felt it wasn’t good for me to stay with the family I was born to, but it was his last wish that I be picked up from where I was and to be raised by Modesto and Nelida. Santa Isabel is on the southern coast of Puerto Rico, a town of eight districts where nearly half the population lives below the poverty line and the unemployment rate rarely drops below 15 percent. With modern highways, it takes approximately an hour-and-a-half to drive to San Juan. Prior to the current roads, though, it was not an easy trip to make. Benito recalls the boundaries of his childhood. “In Santa Isabel where I grew up, we were between the mountains and the sea. It was an area of sugarcane fields. Our baseball field was surrounded by cane, and the train used to pass from one side to another sector around the field. We used to love riding on that train. The baseball, though, even at the young age, it was calling to me. When I was nine years old, I used to like hitting stones with a wooden stick to see where they went. One of them almost hit the teacher of the school, and I was forced to leave that game. Baseball was more than a game though. It was the way to have a dream. Mom and Dad worked hard, but the money was not enough to almost nothing. One day I asked my mom for fifty cents for something I wanted to buy and she told me she didn’t have it to give me. I said, ‘Mom, it’s okay and don’t worry. When I grow up and am a professional baseball player, I'll give you everything you need.’ I don’t know if she believed it was possible, but Roberto Clemente was a hero to every kid in Puerto Rico who touched a baseball. He was proof it could happen. There were other big league players, too, from Puerto Rico, but Clemente was who everyone always thought about first. “Between the ages of ten and eleven were two important parts of my life. This was when I learned about the family I had in Ponce, a town only twenty miles away. My birth mother, Ivette Rivera Resto, came to our home and told my mom that it was time I came to live with her for now. I was to return to my place as the youngest with my brother and sisters, Irene, Magda, Jose, and Luisa. She said she had only allowed Nelida to take me because she was very sick and sad after the death of my father, ‘El Capitan.’ To me, Nelida was my mom, and even though I had grown considerably, she and Modesto had sacrificed their lives to keep me and raise me as God commands. They understood why my father had asked them to take me, and they did not want to surrender me to live in the environment where she (my birth mother) lived. You can imagine how confusing it was for me. A woman from the government came many times to visit. They didn’t try to explain all that was going on, but she did spend months on the case. The whole thing was very ugly because I was underage and it was going to be up to the judge who was handling the case. My mom, Nelida, had cried a lot and told me, ‘Papo, don’t worry that you are going to go with them.’ I didn’t see how it would be right to make me leave. “There must have been a lot of discussion about me, but what I remember was being afraid to say too much. What if I said something I didn’t mean to and the judge didn’t understand? I was scared of that, but it turned out the judge was very calm in talking to me. She asked me who I wanted to go and see—my mother who brought me into this world, or the family that taught me to live in this world and gave me love and understanding? I chose Modesto and Nelida, and for a long time after that, I had no contact with the family in Ponce. I have never regretted choosing Nelida and Modesto. Another piece of this I didn’t know was when I was little, Jose Manuel Santiago, who was called ‘Dog,’ was always aware of me in town. I only thought he was an older kid and didn’t find out he was my real brother until after the case was opened and we went to court. Jose Manuel got along very well with Modesto and Nelida, and he is still my real brother because of how we were born and how he was in my life understanding I was better off not being with my birth mother. “The other part that was very important is I was playing baseball on a regular team with Angel Cruz as the coach. He’s a very good teacher and player and stayed in Santa Isabel as the coach for decades. He saw I had a good throwing arm and I was a pitcher in the sixth grade and threw seven or so no-hitters. I competed all over Puerto Rico, but I was also a clean-up hitter. [A clean-up hitter is fourth hitter in the lineup and is traditionally one of the strongest batters.] I threw fastballs and curves and then I started playing shortstop as I got older and moved up into the next age category. Everyone wants to be a pitcher, and even though I was good, what I loved most was the position of shortstop. I threw some guys out in those first games I played as shortstop—maybe two or three—and my father was in the stands. Cruz was in charge of our team with Humberto Rivera, and they both put a lot of effort into me because they saw my talent early. You can love to play and work hard, but if the raw talent isn’t there, it isn’t. “There were two baseball fields in Jauca where we played, the Tamarindo and the Destino. [Jauca is a district of Santa Isabel.] The first trophy I was given was tiny, five inches high, but I thought it was the most beautiful thing in the world. I slept with the trophy. It was later when I was a teenager that we had a game where the catcher couldn’t play and we had to have a catcher for the game. Angel looked at me and said, ‘Papo, you are going to be the catcher.’ I didn’t want to because I didn’t think I was going to do well. I told him he was crazy, but Angel told me I was crazy. He said I had long fingers and convinced me to wear the catcher’s gear for the first time. He was right, and I threw seven of nine players out who tried to make it to second base. I liked the feeling, and Angel said that it was easier to get to the big leagues as a catcher than as a shortstop and there would always be too many pitchers trying to make it. I told my father I wanted to be a catcher from then on, but that meant I needed extra equipment. We put money together to get me what I needed. My sisters helped by giving up money they had been saving for things they wanted. This is the kind of love we had in my family. “Money is something we always had a hard time with. I started washing cars and could earn between two and three dollars a day, but the sad truth was if you wanted money, the way to get it was to be involved with drugs. The youngest kids would start simple with selling marijuana, and later other drugs. It was tough on the streets in Puerto Rico. A lot of my friends were caught in what seemed like this easy way to make money. Then they began to use drugs and ended up addicted and plunged into a life of crime with prison, or were killed by someone, or died from drugs. I had my talent as an athlete, and my parents taught me what was right and didn’t want me to end up in the streets. As a teenager, you think you don’t have to listen to your parents. My brother Nelson had a strong hand, and he stepped in to take care of and guide me, to try and keep me out of trouble. My best friend, who was like family, was rough and wise to the streets and didn’t want me to be like him either. He and my brother weren’t the only ones. There were other people in our neighborhood who seemed to understand that I had a real chance at baseball because of my talent. If I was hanging out where I shouldn’t be, they would tell me to go home, go play ball, go away from the area where everyone knew trouble happened. Maybe I didn’t listen as much as I should have, and for a while I did some things I wish I hadn’t, but it didn’t last for long. 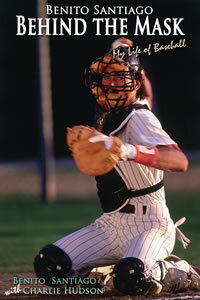 I wanted to play, and the more I became involved in baseball, the less time I had to be in the streets. “In 1980, my friend Humberto Rivera was leading our team of Santa Isabel. We were one of the finalists of Puerto Rico, and we went to San Juan to play for the championship. One of the biggest scouts in baseball, Luis Rosa, was watching the games in San Juan and saw me play. We were practicing on a hot day with mosquitoes swarming around, but Mr. Rosa put on extra insect repellant and watched us the whole time. Mr. Rosa, who everyone knew as a famous scout, invited me to come onto his team of The Raiders in the American Legion in San Juan. This was the first real step if you were going to have a chance at the dream of playing in the big league. The truth was I didn’t like school and wouldn’t study any more than I had to. If I was making D’s and passing, that was okay with me. There wasn’t any way for me to think of going to college and getting to baseball that way. Maybe I shouldn’t have thought like that, but it was a common way of thinking for kids in Puerto Rico. When it came to baseball, I paid attention and was learning the game. To me, that was better than school would ever be, and I cared too much about baseball to listen to any advice about another career. “Now with my time being divided between San Juan and Fajardo, school became even less important than before. My brothers Luis and Nelson Gonzalez had a car that was damaged, and it broke down a lot with us sitting next to it on the road to see if anyone would pick us up to give us a ride. Other times, we could make it to where we needed to go and someone else would take me home. Mr. Rosa did that a lot for me. In the times when we were waiting next to a broken-down car, my brothers would talk to me, give me advice, talk about how I could be something special if I would stay off the streets. I also remember what it was like when I was making those trips. Puerto Rico isn’t a big island, but for me, the area where we lived was what I knew best. The mountains between Santa Isabel and Fajardo made a big impression on me. There wasn’t a wide highway then, and I saw waterfalls, forests, and fields where famous fruits of Puerto Rico grow. The fertile land was very green, and in the times my brothers and I were broken down on the road, I would stare at it while we waited and talked. “When we played games in Fajardo, Luis Rosa paid for the hotel, and that was something special. We slept in the Parador de Fajardo, a hostel near the docks where the boats left for the island of Vieques. Being on the water like that was very different than our neighborhood in Santa Isabel. What we did for lunch was parents prepared a big meal and after the game we ate in the park. We ate very well because the food was very rich. “As good as my coach had been, I wasn’t born with an instruction book for living new experiences and Luis Rosa helped me a lot in this. I was dreaming of the big leagues, but I knew I had to work really hard and gain strength in my arm to reach my goal. From the beginning of when I played, I did it to win. For me, that was what mattered, and I played 100 percent at each game. I was upset when we didn’t win and would review the game in my mind to see what mistakes I made to learn from that and not make the same mistakes again. I was determined to do everything I could to win the next time. For me, this was learning, better than going to school because I wanted baseball to be my life. “It was settled now. I would be a catcher, and when I watched baseball on TV, I saw Johnny Bench, Goose Gossage, Freddy Lynn, and Steve Carlton. I loved to watch how Gossage played, the way in which he threw the ball. When I was little, my favorite major league team was La Maquinaria Roja—the Cincinnati Reds. I also liked the New York Yankees and the Boston Red Sox, but Luis Rosa was scouting for the San Diego Padres at that time. If I was going to make my way in the minor leagues, that would be my path. It wasn’t crazy for me to think this way because two players from Jauca reached the major leagues; Miguel Alicea was a Philadelphia Phillies pitcher, and Santos Torres Denis was an outfielder with Cincinnati. Sao Jose Guzman, who was right there from my town of Santa Isabel, signed with the Texas Rangers. “As hard as I was working to prove I was ready for the big leagues, I met a girl, too, at a party one Saturday night. I had gone to eat at the Metropol in San Juan, which is one of my favorite restaurants in Puerto Rico. I met Blanca Ortiz, and at first, I didn’t know how to talk to her, but I got to know her and we started dating. Blanca was from Salinas; that’s only ten minutes from Santa Isabel. We went to the movies, parties, and she came to the professional games in San Juan to see me play. We had a TV in the living room of the house in Santa Isabel. Every Saturday we watched the games of the big leagues, and we also used to go to a bar near the house in the neighborhood. We met many times to see the games, and I was in love with her. That wasn’t something Benito expected, and as he was to discover, the next few years would be filled with situations he wasn’t prepared for.